Climate change has been a perplexing problem for years. 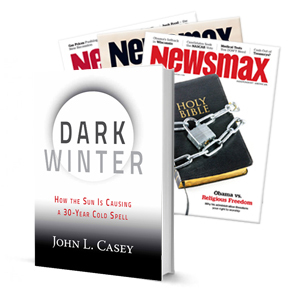 In Dark Winter, author John L. Casey, a former White House national space policy adviser, NASA headquarters consultant, and space shuttle engineer, tells the truth about ominous changes taking place in the climate and the Sun. Casey's research into the Sun's activity, which began almost a decade ago, resulted in the discovery of a solar cycle that is now reversing from its global warming phase to that of dangerous global cooling for the next 30 years or more. This new cold climate will dramatically impact life on the planet. A sobering look at the Earth's future, Dark Winter predicts worldwide, crop-destroying cold; food shortages and riots in the United States and abroad; significant global loss of life; and social, political, and economic upheaval. In Dark Winter, NASA headquarters consultant, and space shuttle engineer, tells the truth about ominous changes taking place in the climate and the Sun.